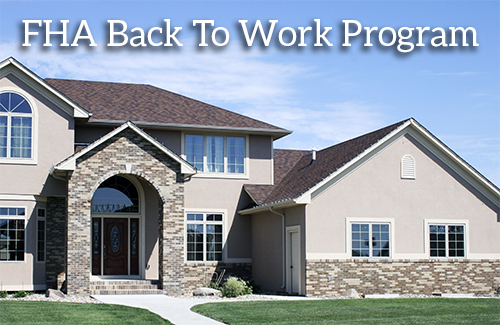 FHA has waived its 3-year foreclosure / short sale and 2 year bankruptcy waiting periods, now via the FHA Back To Work Program – Extenuating Circumstances, now as a borrower, you can buy a home 12 months after a Foreclosure, Bankruptcy and/or Short Sale. On August 15, 2013, though, the Federal Housing Administration moved to relax its guidelines for borrowers who “experienced periods of financial difficulty due to extenuating circumstances”. Dubbed the “Back To Work – Extenuating Circumstances Program”, the FHA removed the familiar waiting periods that typically followed a derogatory credit event, to allow home buyers in Florida to be able to get an FHA Loan via the FHA Back To Work Program. The FHA realizes that, sometimes, credit events may be beyond your control, and that credit histories don’t always reflect a person’s true ability or willingness to pay on a mortgage, but NSH Mortgage will work with you to make sure you can get a home loan on your next house purchase. To learn more about FHA Loans, beyond just the FHA Back To Work Program, head over to our FHA mortgage page or contact NSH Mortgage today.